West Shore Cafe and Inn wedding photographer taking a picture of a couple's first dance on the lake front deck at dusk. 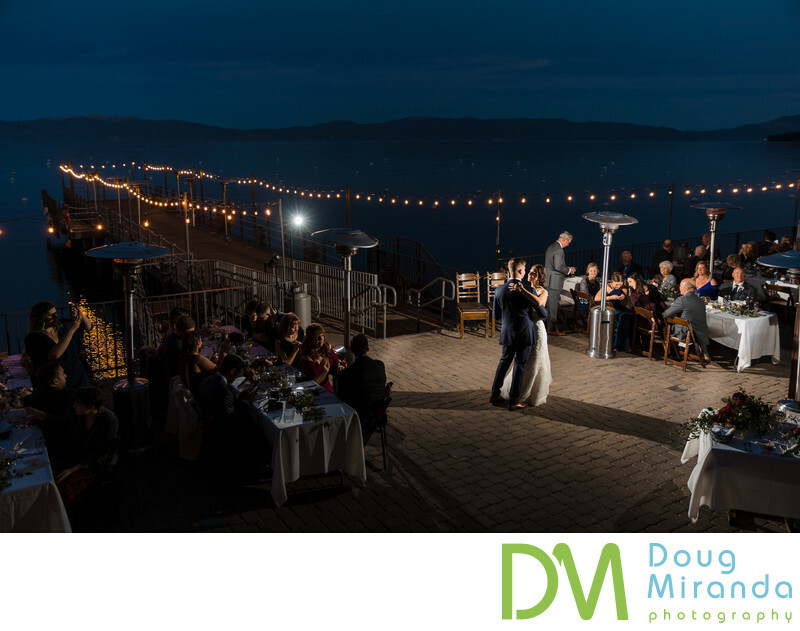 When I was photographing their dance I captured all the safe shots and then I ran back and up onto the stairs to grab this different vantage point of the newly weds with the lake in the background. The venue has many locations for you ceremony and reception to take place at. For larger ceremonies the West Shore Lakefront Lawn is where you’ll be married at. The edge of the lawn runs right up to the edge of the lake. For smaller ceremonies you can get married on the West Shore Lakefront Pier, which jets out over the lake. You can also have smaller dinners on the pier. For larger receptions and dinners your event can take place not eh West Shore Lakefront Deck and Pier, which can hold up to 200 guest max. The Lakefront Deck can hold up 150 gust max. Lastly your reception can also take place in the West Shore Lakefront Dinning Room. This is a great location for those cold Tahoe nights. The Lakefront Dinning Room is also the location for winter wedding ceremonies. With so many options for your wedding day and being right on the lake it’s a no brainier that this wedding venue is a top pick for couples getting married in Lake Tahoe.